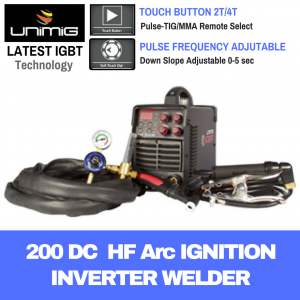 The RAZOR200ACDC is a Digital Controlled Square Wave AC/DC TIG inverter welder. Intelligent digital control of the main functions are realised by software providing ease of operation and high accuracy, software upgrade is possible by simple download function. It is an exceptional machine with new standard for 240V AC/DC welders making it the ideal choice for experienced or novice welders of Aluminium, Stainless and Steel materials. So, why don't you spend money on stuff that's built for longevity and reliability at discounted price? BUY and SAVE NOW. PACKAGE INCLUDES: - Razor AC/DC 200 machine - SR26 TIG Torch - LS25 4m Arc Welding Lead and Clamp Set - 2m Gas Hose - Argon Flowmeter Regulator. Full TIG functionality, offering simple step by step digital control of functions and parameters providing complete professional control. HF arc ignition provides pre-gas with instant arc ignition leaving no tungsten inclusion or contamination of the tungsten electrode. Digital set of Pre Gas Time, Start Current, Up Slope and Down Slope Time, Finish Current Level and Post Gas Time with the choice of 2T or 4T trigger function allows control of the welding process at a professional level from start to finish. Digital Pulse Control gives full parameter setting of Peak & Base Current, Pulse Frequency & Pulse Width providing control of heat input, penetration & distortion. AC Square Wave Bal-ance gives control of the electron flow at the tungsten, the AC Tig arc can be adjusted from maximum oxide-layer cleaning on aluminium through to a deeper penetrating weld. Remote Control Interface provides optional remote amperage control at the torch or foot-pedal control. DC MMA welding delivers a smooth and stable arc for easy welding of electrodes producing high quality welds including cast Iron, stainless and low hydrogen. Arc Ignition and Arc Force control allows you to set the ideal arc condition no matter what electrode you choose. Optimised auto protection of the power input provides auto shut down of the machine when large scale flucuations occur. Unique air channel design increases the heat dissaption of the power device, control circuits, minimises dust absorbtion, thereby greatly improving longevity and reliabilty. Built to our specification and manufactured in compliance to AS/NZ60974.1.